Enjoy private log cabin lodging at The North Forty Resort. Affordable options are available for the lone traveler, family, or group of friends. Our log cabins offer all of the comforts of home, combined with the luxuries of a resort. Cabins have full kitchens, complete with cooking utensils and chinaware, dining areas, and one or two private bathrooms. The comfortable living areas are enhanced by quality log furnishings and your own fireplace. Covered porches, barbecues, and picnic tables at each cabin make outdoor dining a fun and easy alternative to restaurants and eating indoors. We also offer other outdoor opportunities, such as a common recreation area, a sheltered hot tub, a campfire area, and trails on the property for walking or cross-country skiing. All sizes of comfortable beds (complete with down comforters) provide the perfect end to your day. 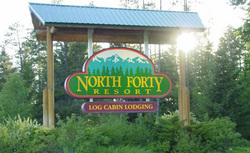 Directions: The North Forty Resort is centrally located and easily accessible from all surrounding areas. We are on Route 40, just two and one-half miles east of the junction of Routes 40 and 93. Conveniently, The North Forty is just five minutes from either Whitefish or Columbia Falls and fifteen minutes from Kalispell. Glacier Park, Flathead Lake, Big Mountain Ski Area, golf courses, and fine restaurants can all be reached in less than half an hour's drive from The North Forty Resort.